After high hopes, South Africa’s participants miss out on podium finishes. 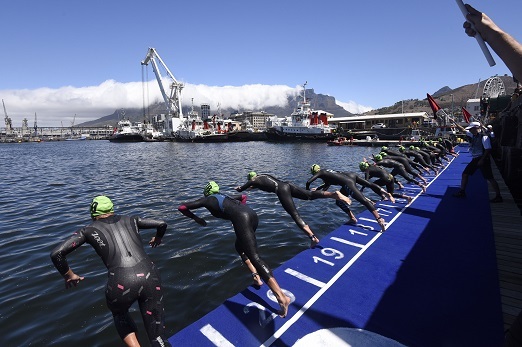 South Africa missed out on a medal at the international triathlon season opener for the first time in three years, with Henri Schoeman and Gillian Sanders falling narrowly short of podium places at the Discovery World Cup race in Cape Town on Sunday. With defending champion Richard Murray pulling out ahead of the event after picking up an ankle injury, Schoeman led the local charge in the elite men’s race which was delayed by half an hour due to a power failure. The Commonwealth Games champion, who took the runner-up spot behind Murray the last two years in a row, had a superb start in the water and was leading off the bike. He was soon caught, however, by British athlete Alex Yee, who tore clear on the run leg to take the win. Yee covered the sprint distance – including a 750m swim, 20km cycle and 5km run – in a time of 52:04. Though Schoeman pushed hard to keep up the pace at the front of a small chase group on the run, he lost out in a sprint and settled for fourth place in 52:21, less than two seconds outside a place on the podium. “It was a bit crazy with the delayed start but I had a good swim, and all in all I’m happy with the way I executed,” Schoeman said after the race. “I had no legs on the bike or the run, so it wasn’t my best day, but I picked up some good (world ranking) points. Sanders, meanwhile, looked to be battling to close the gap on the leaders on the bike but she produced a spectacular run to take fifth position in 58:10, with Japanese athlete Ai Ueda securing victory in 57:23. Delivering her best performance in more than two years on the World Cup circuit, the 37-year-old Sanders was delighted to be back in form after recovering from two crashes on the bike last season. “After last year I think I deserve a bit of luck,” Sanders said.